The last I talked about bibimbap was here, but to those who don’t eat at my house (almost all of you), it was a continuous exercise for me until I realized I eat waaaay too much when making this. So instead of a daily experience, it has become a once in a bluemoon kind of recipe. It was while eating paella that I got excited to make this for breakfast. My favorite meal of the day would become the best bibimbap ever. I decided to “clean-up” the fridge by using my leftover chicken confit, and some rice in the fridge as well. But everything else, it was fresh. 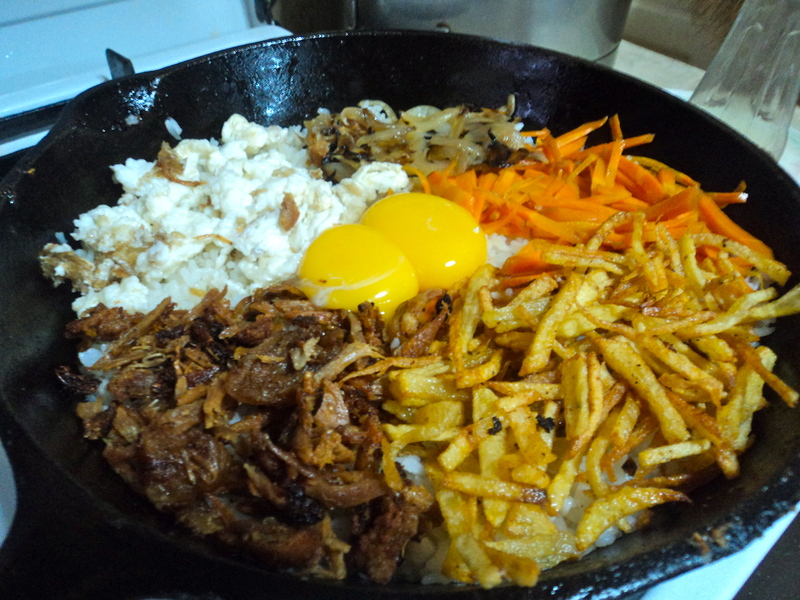 I sauteed some julienned carrots, scrambled egg whites (I used the egg yolk for the bibimbap), caramelized some onions, fried some matchstick-sized potatoes, and flaked the confit and fried it into curnchy flakes. I just wanted to make sure I had variety, flavor and texture. I heated the pan again, heated the rice with some sesame oil, and placed each of the ingredients. I placed the egg in the middle, added more sesame oil, and sprinkle of salt, then off to the table. I wanna make versions of this again. 🙂 And if you want to make your own, you can, with anything on it. Two things are constant though, the sesame oil and the gochujang.